Ham is a staple at most Australian and European Christmas meals and we wanted to still to be able to enjoy a glazed ham at Christmas. 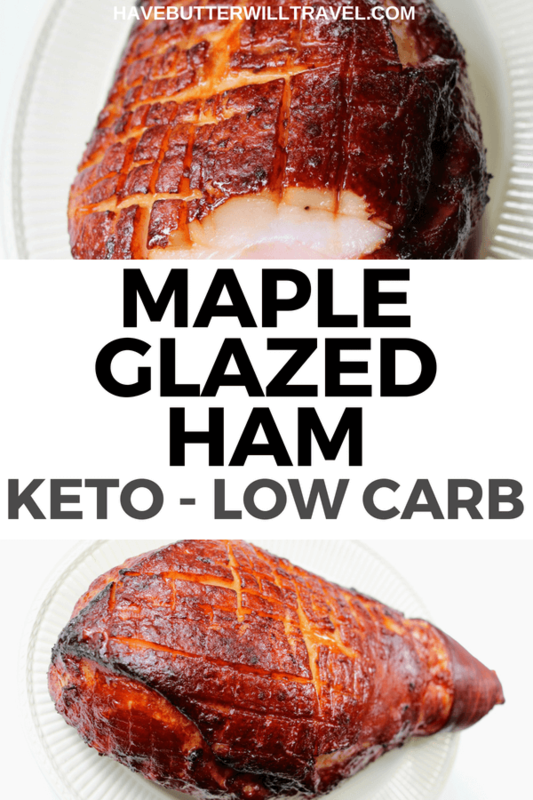 This keto ham was a great option for us. We tested this out on non keto family members and it was a big hit, even if they put it on bread! Ever since I can remember our family would order a ham for Christmas. It was tradition in our house to have sliced up ham on toast for breakfast for the week leading up to Christmas and any leftovers the week after Christmas. I can remember Dad slicing up some every morning and placing a plate of it on the breakfast table and we would demolish that plate every morning. I loved ham on toast at Christmas, it was one of the favourite things I remember from my childhood Christmas’s. Our family never did a glazed ham for Christmas, but Erika’s family did. So, I was introduced to glazed ham at my first Burt Christmas in 2007. I can remember wondering, why has my family never done this, it’s so good. As this was part of Erika’s family tradition we wanted to see if we could come up with a keto version, so both of us could continue to enjoy our favourite Christmas tradition. I still have the ham on toast, I just only have it once and I put it on a low carb bread instead of the traditional white bread. Erika’s Mum made this keto ham at our last Christmas and it was a big hit with everyone and will become the way ham is done at her family Christmas from now on. 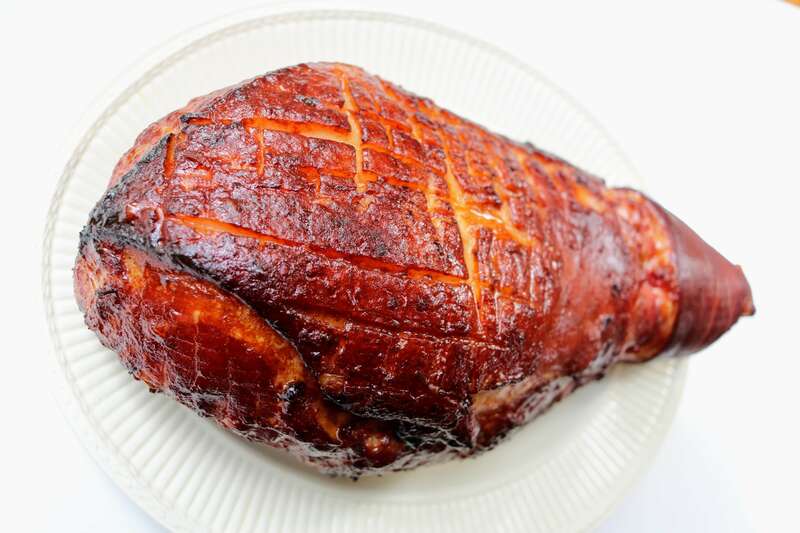 Since posting this recipe in December 2017 we have become aware that glazed ham is extremely popular at Easter in North America. I was interested to discover the tradition behind ham at Easter in North America. Prior to refrigeration, meat would be slaughtered in the fall. Any fresh pork that wasn’t consumed in the winter months was cured and consumed in spring and became a tradition to have at Easter. Leftovers! The great thing about having a glazed ham for Christmas is all the leftovers and being able to eat this for the next few days is an added bonus. 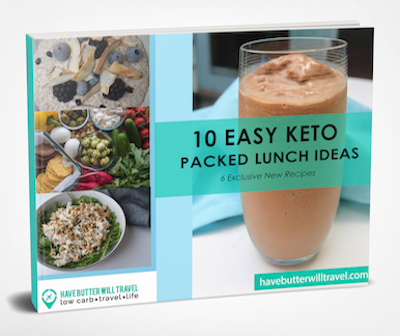 You can always use some to create another awesome keto meal like a Fritatta or egg muffins. When we cooked our keto ham, we ended up with a lot of ham leftover. We found it was great to eat for lunch a few days later, but after that we didn’t want to have ham any more for a while and we needed to find other ways to use it. We made up some breakfast muffins and a frittata and stored them in the freezer for lunches and breakfasts on the go. Tag @havebutterwilltravel on Instagram or twitter with your Christmas table photos, we would love to see your celebrations! Did you make keto ham for Christmas or Easter? 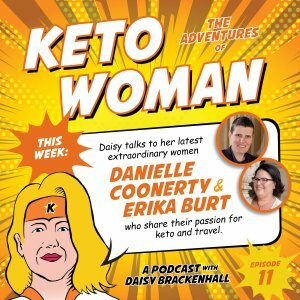 We would love to hear how you made your keto ham and what you found worked best for you. Check out our other meal recipes. Ham is a tradition at Christmas and Easter meals. This keto ham is delicious. It is maple glazed and perfect for Christmas and Easter Lunch or dinner. Combine all ingredients for the glaze in a bowl and stir until smooth. Use a small sharp knife to score the skin of the ham around the small hock section. Then slowly peel the skin off by pushing your fingers between the skin and the fat and working your way around. Once the skin is completely removed score the fat with diagonal lines. Just be careful not to score too deep into the meat. Brush the glaze over all the exposed fat on the ham leg and place in the oven for 20 minutes. Remove the ham from the oven and baste with glaze and return to the oven for 10 minutes. Repeat glaze again and put in the oven for a further 10 minutes. Baste for a final time, turn the oven up to 200 degrees celsius (400 Fahrenheit) and cook for a further 5-10 minutes. Keep an eye on it as it may brown quickly. Nutritional information for this recipe will be dependant on the type and size of the ham you use. 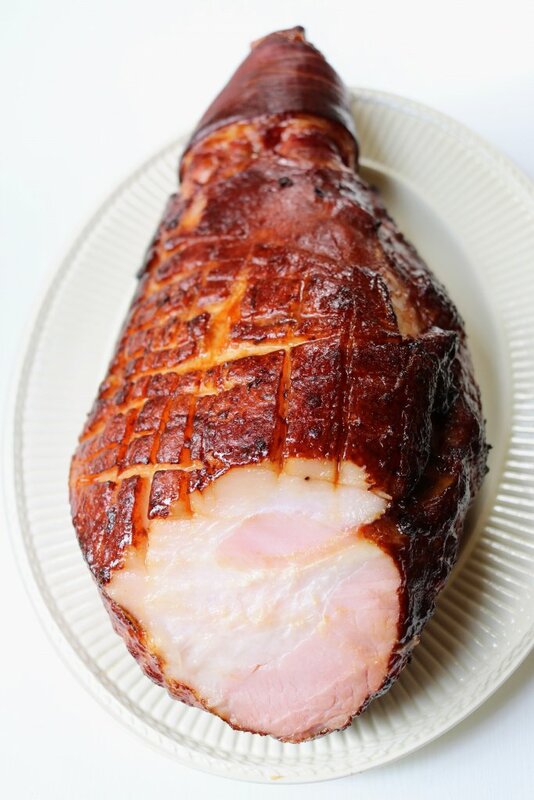 I just had to let you know everyone at the Christmas table loved your Keto Maple Glazed Ham recipe, it was a great success & I look forward to trying more of your recipes. 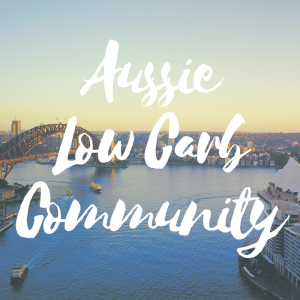 Thank you for the feedback – that is great to hear! If I were adjusting the ingredients for a quarter leg of ham (only need to feed two people) would I need to adjust the cooking time also? As you aren’t cook the ham as such and just cooking the glaze and warming the ham, I think the cook time will be similar. I would aim to follow the cook time instructions but keep an eye on it. is this recipe using an existing smoked ham? Ours is the Nature’s Rancher Spiral Sliced NO SUGAR Ham. Can we use this ham to make the above recipe? If so, any changes to make? Thanks so much!!! Hi Jennifer, Ours isn’t smoked, just cured and we use a whole ham not a pre sliced ham. I’m not sure glazing a sliced ham would work. You shouldn’t need to make any changes to the recipe as it’s the glaze you are making really. I was interested in cooking your KETO friendly glaze BUT there were too many pictures of a train in one recipe (7 photos to be exact,!) I accept that you have to sell Ads, but 7 in one shirt recipe is TOO MANY. I will look elsewhere for my recipe! Thanks for your comment. We appreciate that ads can be annoying. We hope you have a good keto Christmas. 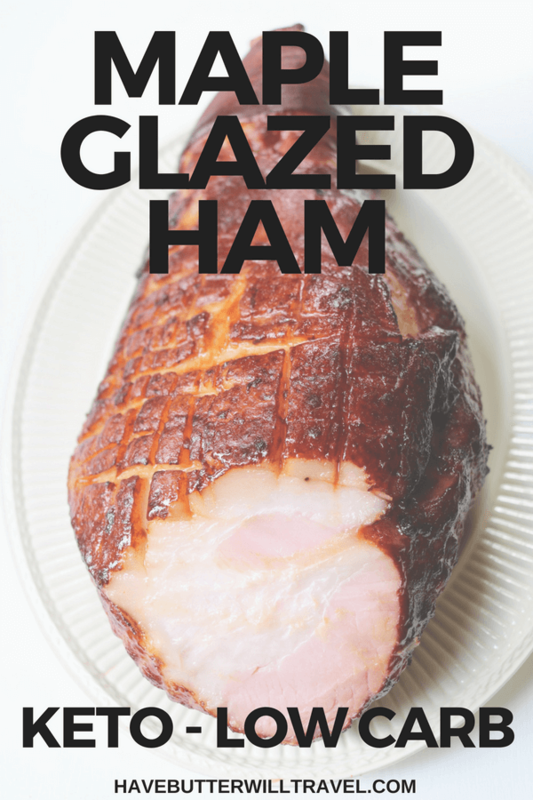 This glaze recipe literally just transformed the way I will cook any future hams in my kitchen This was fantastic and a huge hit with the entire fami!y. Thanks for sharing! Glad you found this recipe. It’s a great keto glaze option. What if I don’t have the coconut stuff? How would it taste if I skipped that? You can replace it with soy sauce or Tamari. I’m not sure how it would be without it as it adds some saltiness. You think this could be made in the crockpot? And could I use sugar-free pancake syrup instead? If so, what would the directions to the crockpot be? THE HAMS I’VE CHECKED AT OUR STORE ARE CURED WITH SUGAR, EVEN THE NITRATE/NITRITE FREE HAMS HAVE SUGAR IN THE INGREDIENTS. 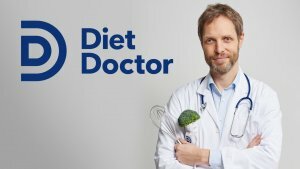 IS THAT OK FOR A KETO DIET? Most of them are going to be cured in a small amount of sugar. I would at the nutritional panel and go for the lowest sugar. All the bacon I eat has sugar in it and we dont get kicked out of ketosis.